"Declared illegitimate aged 3. Tried for treason aged 21. Crowned Queen aged 25." Elizabeth is a biographical film about Queen Elizabeth I of England. She is played by Cate Blanchett. It also stars a number of well-known British actors such as Geoffrey Rush, Joseph Fiennes, Sir John Gielgud, Christopher Eccleston and Richard Attenborough. The film follows the early days of Queen Elizabeth’s reign, as she learns what it means to be a female ruler of a country. She inherits the throne after her Catholic half-sister, Mary I of England, dies. Early in the film, she is urged to marry by the statesman Sir Cecil (Attenborough). She is also courted by many suitors, including the future King Henry III of France. However, she is deeply in love with her childhood sweetheart Sir Dudley (Fiennes). Her right hand man and advisor, Francis Walsingham (Rush), is a ruthless man who teaches her how to fight her enemies. Throughout the film, she must deal with several of them. First, there is the Catholic Duke of Norfolk (Eccleston) who wants her dead because he considers her a heretic. Then there is Mary, Queen of Scots, who plots to kill her and Mary’s mother who sends French troops to attack Elizabeth’s army when they enter Scotland. Elizabeth wishes to unite England under one church, but she has opposition from the bishops and the pope (Sir Gielgud). In spite of their plots to stop her, she begins to push religious reforms instead of solving her disputes through marriage. She does not want any man to dominate her. In fact, she eventually dismisses Sir Dudley from her court. 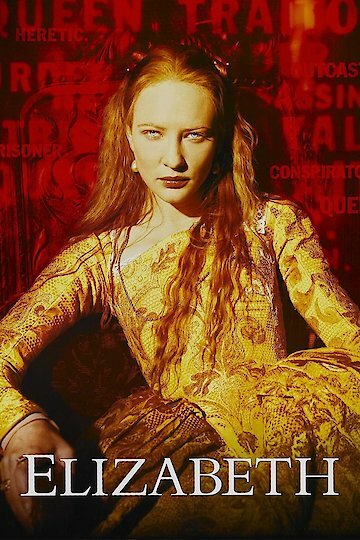 Throughout the course of the film, Elizabeth changes from a naive, young girl to a dominant, forceful queen. She becomes fiercely independent and gains a reputation as the Virgin Queen. Elizabeth is currently available to watch and stream, download, buy on demand at Amazon Prime, Starz, Amazon, Vudu, Google Play, FandangoNow, iTunes, YouTube VOD online.